My faithful traveling companion and four-year-old daughter, Molly, accompanied me to Bloomingdale’s in Manhattan last week for the U.S. debut of Pearls & Popcorn (check out the website to see the unique media campaign featuring cutting edge 3D CGI animation). Paris designer and mom to a little boy, Ronit Pardo has brought her line, named for the sophistication and fun that are required of children’s clothing, exclusively to Bloomingdale’s this fall. The line is sized from three to 36 months and incorporates classic styles, characteristic of the best Parisian fashion, with a whimsical, joyful spirit. I love the very simple but smart details that do, as Ms. Pardo explained to me, exemplify a “mini-me” adult wardrobe for our children. The girls and boys clothes are indeed tiny versions of my husband’s and my favorite outfits: plaids and simple cotton tees abound. 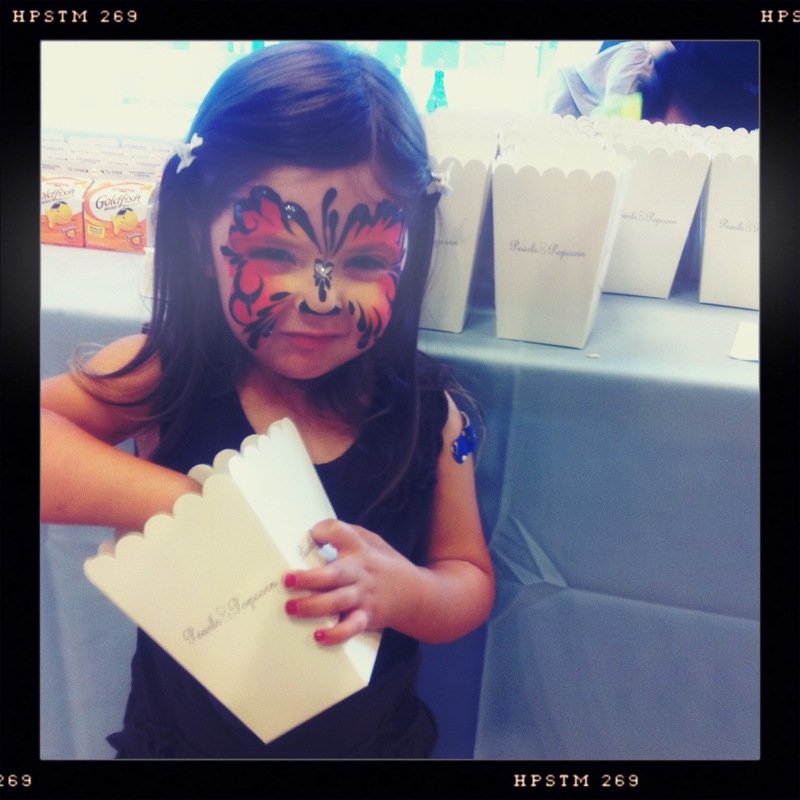 The debut party was a lot of fun for Molly; while I perused the adorable dresses, smock tops and skinny jeans for tots, Molly had her face painted and indulged in more than one tub of popcorn. We were both in our element. I started looking through the line to see if there were anything I could bring home for my two girls and one boy. 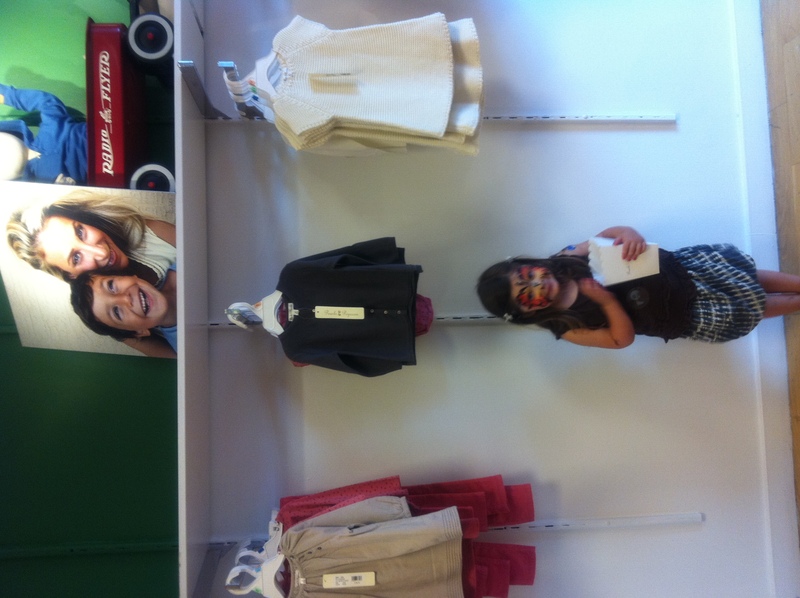 To be honest, I expected the line to be more than I could afford–or would be willing to pay for children’s clothing. I was happily surprised that we were able to walk away with an adorable tee shirt for about $20 and a pretty blouse for about $40 (approximate prices). I usually shop at J. Crew’s Crewcuts, and I wait for their clothing to go on sale. I think the Pearls & Popcorn line is priced, as the designer describes, to be “accessible.” Some pieces were more than I would or could pay, but several, including the infant outfits, were well in the affordable range. They also seem very well made, with soft cottons and adorable details. There is one item of clothing from Pearls & Popcorn not available yet at Bloomingdale’s, but I was told it is coming: harem pants. I swear I never thought I’d covet harem pants for my 2.5 year old. But I do. Let me know when they get here, okay? Please visit Momma’s Gone City to read this original post and many awesome posts by Jessica. I received no compensation for this post. All opinions are my own.